Issue #188 • January 16, 2014•Buy Now! Sergeant Bill Marshall was the one who found her white bones in a fetal position, nestled inside a tweed coat and a red woolen hat. She was lying in the hall on the worn wood floor, just outside the living room. At first, he wasn’t even sure what he was looking at. The station had received a call from the postmaster and another from a neighbor, both saying that the house seemed unoccupied. The utilities had apparently been shut off. Marshall and his partner, Jim Sullivan, had broken down the front door with an ax and stepped into piles of mail, their boots leaving muddy footprints. The stale smell of the house leached out into the late afternoon air. It was March, so the sun was weak and just barely made its way into the house through the now gaping entrance. The hall was dark. Marshall saw the coat and the hat on the floor but at first thought they had just been left there, along with the mail and newspapers and a pair of shoes, neatly placed next to the baseboard. But something caught his eye. A slip of white, sticking out of the coat sleeve. Laura Spence-Ash has worked in research, marketing, and administrative capacities for Princeton University, Fox Broadcasting, and CBS. She holds an MBA from New York University and a BA from Pomona College. She has attended the One Story Workshop for Writers, the Community of Writers at Squaw Valley, and the Napa Valley Writers’ Conference. This is her first published story. She lives in Princeton, New Jersey, with her husband, two children, and two dogs. In our latest issue, we’re thrilled to present Laura Spence-Ash’s first published story, “The Remains.” I’m a sucker for mystery, and this story had me from the start: “Sergeant Bill Marshall was the one who found her white bones in a fetal position, nestled inside a tweed coat and a red woolen hat.” The “her” in question is Sophie Constantine, who, we learn, lived a quiet, solitary life in a bustling Queens neighborhood. The cause of Sophie’s death is revealed soon enough, but “The Remains” is more concerned with the bigger question of who she was. 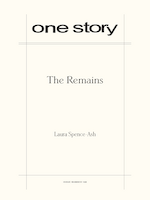 Spence-Ash tells the story in five sections, each from the perspective of a different character who knew Sophie or was in some way touched by her death: the police officer who found her skeleton, her next-door neighbor, her tailor’s daughter, her former boss, and her ex-husband. Over the course of these five mini-stories, a nuanced and moving mosaic of Sophie emerges. It’s a story about death, yes, but it’s more a story about life: how we exist, beyond the grave, in memory, and how our lives affect the lives of others, often in ways we’ll never know. Be sure to check out our Q&A with Laura Spence-Ash to learn about the real-world inspiration behind her debut story, how long it took her to write it (my fellow slow writers, you will be comforted), and more. LS: I read an article in the newspaper about a woman whose bones were found in her house in Brooklyn. I was fascinated—and dismayed—that someone could have been so isolated that no one would have realized she was gone. I started thinking more about that, and Sophie’s story was born. LS: In early drafts, each section was much shorter, and readers said that it didn’t work to use the multiple points of view. I knew I wanted to tell the story in that way, though, so I just kept working on it. I think it helped to create a full narrative arc for each character. WA: And the most satisfying aspect? LS: I loved the editing process with you and Hannah. I learned so much about where and how I go wrong, and how to fix things to make them stronger. WA: Much of this story involves the process by which a human corpse decays. What kind of research was involved? LS: At the Anthropology Research Facility at the University of Tennessee, they conduct research on dead bodies, and I learned a great deal by reading up on their findings. Hannah also recommended Stiff: The Curious Lives of Human Cadavers by Mary Roach, which is a terrific source for learning about the decaying process. WA: It’s rare that a story’s central character isn’t a viewpoint character and rarer still when that character is a skeleton. What were the particular challenges of, um, fleshing out Mrs. Constantine? LS: This was one of my motivations to write this story—I really wanted to see if I could write a story in which the protagonist is dead and doesn’t exist except through flashbacks. We get to know her only through the memories of other characters, and so we create a mosaic of Sophie by putting together the different viewpoints. I also wanted to capture that a person exists after death through the multiple memories that remain. WA: This story is also unusual in that it comprises the stories of five different characters, presented in discrete sections. Do you often experiment with unconventional narrative structures? LS: Yes, I’m very interested in point of view and in telling stories in different ways—often that’s my inspiration, rather than a specific storyline or character. Something that really intrigues me is having the content of the story play out in the narrative structure. I have another story in which two characters are battling each other to become the patriarch of their family, and they fight for narrative control of the story as well. WA: I was particularly moved by the story’s final section—which is told from the perspective of Mrs. Constantine’s ex-husband, Mel—and by the ending in particular. Did you have the ending in mind from the start, or did it come to you later? LS: I didn’t have the ending at all when I started. It was only as I wrote Mel’s section and was with him in the house that I discovered the ending. In fact, in an earlier draft, Mel didn’t know about the box in the closet, because I didn’t know about it either! LS: I started this story in 2008, so it’s been around for quite a while. I workshopped it several times, feeling as though it had potential, but something wasn’t quite clicking. The advice from you and Hannah really helped to deepen and refine it. LS: I’ve had a novel in mind for a few years but have really struggled with the right way to approach it. I recently decided that using the second person voice—having each of the three main characters tell the story to each other—could be the best way in. It takes place in the mid-twentieth century, so I’ve been doing lots of research, which I love, and not nearly enough writing.